All fans of acoustic music and soft rock, have we got a treat for you! The “Better Together,” singer Jack Johnson is back with an all-new album, coming this fall and accompanied by a North American tour! 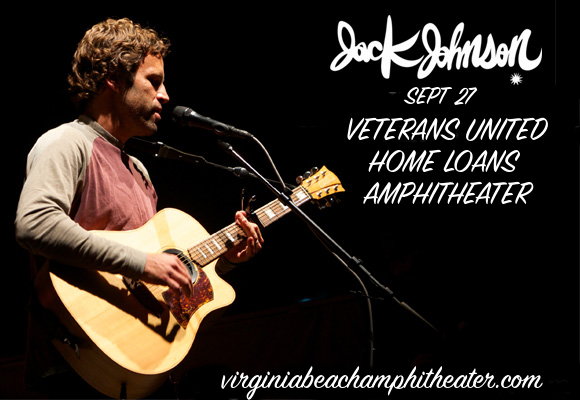 Jack Johnson will perform live at the Veterans United Home Loans Amphitheater on Wednesday 27th September 2017 – don’t miss out! Grab your tickets now and get ready to experience the magic of Jack Johnson live!! Initially gaining success with his debut album, “Brushfire Fairytales,” Jack Johnson went on to achieve massive popularity in the US and across the world for his simple, yet soulful songwriting. Four of his seven albums – “Sing-A-Longs and Lullabies for the Film Curious George”, “Sleep Through the Static”, “To the Sea”, and “From Here to Now to You” – have topped the Billboard 200. Raised on the North Shore of Oahu, Hawaii, Jack Johnson started surfing from the age of 5, and picked up the guitar just a few years later. A deep love of the ocean and concern for the planet has affected his musical career, leading him to create the Johnson Ohana Charitable Foundation and the Kōkua Hawaii Foundation. In 2008, he donated 100% of the money raised through his Sleep Through the Static tour to the Johnson Ohana Charitable Foundation. The new album, entitled “All The Light Above It Too,” has a strong political and environmental message with its first single and lyric video, "My Mind Is for Sale,” indicating Johnson’s upcoming tour will be another effort to raise awareness about the changing climate of our planet. Be a part of it all – book your Jack Johnson tickets today! !